LOS ANGELES - After a wobbly start, Dwayne Johnson muscled his way to a No. 1 opening for “Rampage” - but just barely. 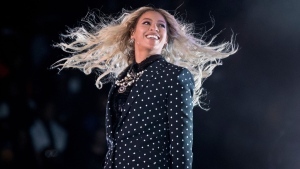 Close on its heels was the word-of-mouth sensation “A Quiet Place” in its second week in theatres, and not too far behind that was the Blumhouse horror “Truth or Dare” in a competitive weekend at the box office. Warner Bros. said Sunday that “Rampage” earned an estimated $34.5 million in its first weekend in North American theatres, and dominated internationally too with $114.1 million from 61 territories. Based on the classic arcade game, “Rampage” carried a sizable budget of at least $115 million. 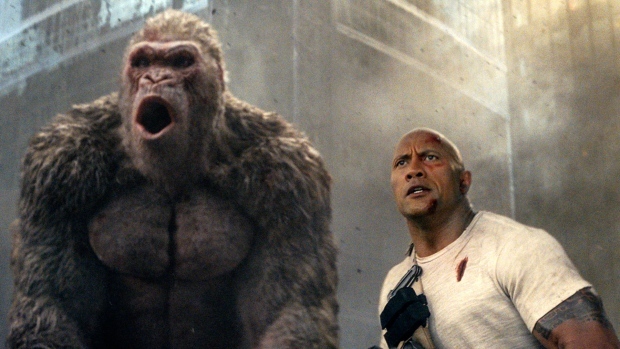 Although “Rampage” pulled in mixed reviews (it's at 50 per cent on Rotten Tomatoes), audiences were more enthusiastic, giving it an A- CinemaScore. After its stunning debut, John Krasinski's modestly-budgeted “A Quiet Place” fell only 35 per cent in weekend two, adding $32.6 million to its domestic total, which is now just shy of $100 million for Paramount Pictures. “Truth or Dare” also found a sizable audience that was mostly young (60 per cent under the age of 25) and female (60 per cent). The PG-13 rated pic stars “Pretty Little Liars” alum Lucy Hale. Sliding into fourth place was Steven Spielberg's “Ready Player One,” with $11.2 million in its third weekend, and in fifth was the R-rated comedy “Blockers,” with $10.3 million. Also, after a limited release, Wes Anderson's stop-motion animated “Isle of Dogs” added 1,385 locations and took the No. 7 spot with $5 million. Chloe Zhao's well-reviewed indie “The Rider” also debuted this weekend in three theatres with $45,268. While the success of a horror, especially a micro-budget one, isn't a surprise for the industry, big budget films like “Rampage” continue to face a complex marketplace. For box office analysts like comScore's Paul Dergarabedian, “Rampage's” performance fits into the post-“Black Panther” narrative for most would-be blockbusters that have followed the Marvel and Disney phenomenon. “'Rampage' joins a long list of popcorn movies that have opened in the wake of 'Black Panther' to rely heavily on their international box office revenues,” Dergarabedian said, citing “A Wrinkle in Time,” ”Tomb Raider,“ ”Pacific Rim: Uprising“ and ”Ready Player One“ as recent examples. Disney and Marvel's “Black Panther” added $5.3 million in its ninth weekend in theatres, bringing its domestic total to $673.8 million. It's another down weekend for the industry, too. The same weekend last year saw the massive $98.8 million opening for “The Fate of the Furious.” ComScore reports that the year to date box office is down just over 2 per cent. But the tide could be turning soon. “We're just in this lull waiting for 'Avengers: Infinity War' that is going to blow the doors off of the box office in a little less than two weeks,” Dergarabedian said. 2.“A Quiet Place,” $32.6 million. 3.“Truth or Dare,” $19.1 million. 4.“Ready Player One,” $11.2 million. 7.“Isle of Dogs,” $5 million. 8.“I Can Only Imagine,” $3.8 million. 9.“Tyler Perry's Acrimony,” $3.7 million.